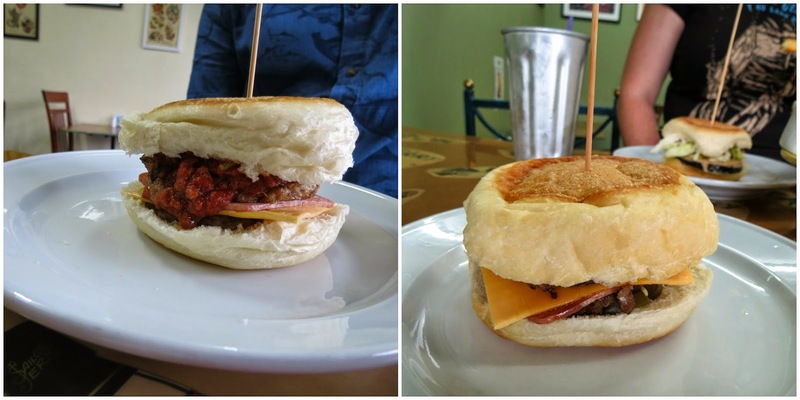 January 2016: Spot Burger closed in March 2015. 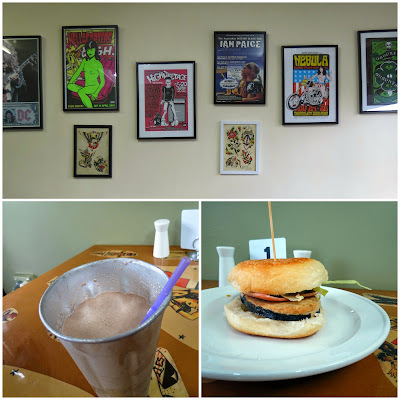 We've had our eye on Spot Burger for a while - it opened up over a year ago as Il Gobbo, went quiet for a while and then reopened with a new name but the same basic premise: vegan junk food served out the front of a tattoo place in Essendon. With our trusty junk-food liaison officer Clamps in tow we headed off one Thursday night to finally check it out. It's an unassuming space - basic tables, a few rock posters on the wall and a pretty fast-foody sort of vibe. The menu is all vegan and all Americana: 6 burgers, 4 hot dogs, a sub, the usual fries and nugget sides plus shakes and a few desserts. It's mock-meat heavy and pretty affordable (nothing over $10) - think Lord of the Fries in the suburbs. The three of us decided to stick with burgers. I went for the volcano: a TVP-based patty with mock bacon, vegan cheese, hot sauce, jalapenos and onions ($10, right in the photo below). I was pretty happy with this - the patty had some nice charred crunchy bits and held together pretty well. The bacon had a bit of crispiness as well and the mix of chilli sauce and jalapenos made sure that there was plenty of flavour. Clamps went for the Calabrian, a mock chicken patty with bacon, cheese, onion and bolognese sauce ($10, left in the photo above). It was a big, messy feast - bolognese sauce on a burger is a genius idea. Cindy couldn't resist the Sailor Jerry, Spot's version of a fish burger with a battered mock fish patty, cheese, lettuce, onion, pickles and herbed mayo ($10). The fish was a standard pre-packaged version, but it worked pretty well in a burger, with a good slathering of tartare-style sauce and pickles adding some tang to cut through the batter. She also ordered a chocolate shake ($6, also vegan) - it was sweet and frothy and not particularly subtle, but a worthwhile burger accompaniment. We shared some chips as well ($7), which were crispy, salty and generously portioned. Spot Burger is a welcome addition to Melbourne's increasingly diverse vegan junk food scene - it doesn't offer a vastly different product to Lord of the Fries, but it's great to have something like it in Essendon, where the vegan options are probably a bit thinner on the ground. I'm keen to sample their hot dogs one day, but the location will mean that we're only occasional visitors to Spot. The Good Hearted, Veganopolous and vegawesome! were all impressed by Il Gobbo when it first opened, but nobody seems to have blogged it since the name change. Accessibility: The entry from the street is flat and there's a reasonable amount of space inside. Tables are a mix of high bar stool style arrangements and regular low tables. We ordered at the table and paid at a high counter. We didn't visit the toilets. I'll have to recommend this place to a colleague who's vegan and always struggles to find good 'dirty food' options. Do they do gluten-free burgers as well?